Saelig Company, Inc. has introduced the Pico Technology PicoVNA 106 Low-Cost Vector Network Analyzer - an economical USB-controlled, professional-grade 300kHz to 6GHz Vector Network Analyzer (VNA) with excellent performance, portability, and affordability. Despite its small size and low cost, its full-function, minimal-error, ‘Quad RX’ four-receiver architecture supports both 8- and 12-term calibration without the uncorrectable switching errors, delays, and unreliability of traditional three-receiver designs. The instrument supports convenient calibration methods such as ‘enhanced isolation correction’ and ‘unknown thru’. The PicoVNA 106 has a dynamic range of up to 118dB at 10Hz and only 0.005dB RMS trace noise at its maximum bandwidth of 140kHz. It can gather all four S-parameters at just 190usec per frequency point, so a 500 point 2-port S2P Touchstone file (compatible with many test, math, view and EDA simulation tools) is captured in less than 1/10 sec. This performance compares with other full-function VNAs that are more than four times as expensive. The PicoVNA 106 is even cost-effective as a high-dynamic-range scalar network analyzer where phase measurements are not needed, or even as a single-port vector reflectometer. The product also includes bias-Ts for the convenient injection of a bias or test stimulus. The PicoVNA 106 software's two utilities address gain compression (P1dB) and AM to PM. Both of these use a port power sweep at each test frequency, with both measurements extracted using second-order interpolation. Today’s engineers don’t have time to become microwave specialists. They need a straightforward, accurate, fast, portable and low-cost measurement instrument, and ideally one that can support developing applications such as 5G, IoT, radar, and tissue and materials imaging. Pico Technology’s expertise in compact USB instrumentation, combined with its experience with high-performance sampling oscilloscopes and time domain reflectometry, has created a VNA that can characterize high-frequency interfaces, devices, multi-path interconnect and antennas. The PicoVNA 106’s remote automation interface suits test automation needs, or as a reflectometry or transmission measurement module for embedded installations. Test environments include broadband interconnect, cable and harness, antenna, component or subsystem assembly, installation and fault over life, in the manufacturing, calibration, distribution and service industries. 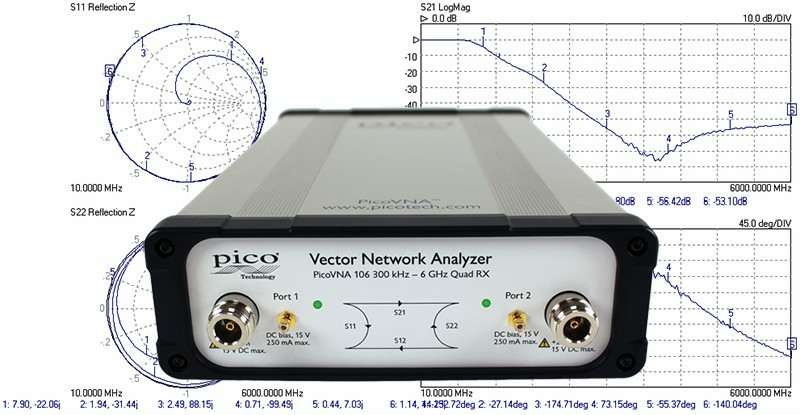 Made by Pico Technology, Europe’s award-winning test and measurement manufacturer, the new PicoVNA 106 Vector Network Analyzer is available now from Saelig Company, Inc. their USA technical distributor.